It sounds like what a real estate broker will say, but what I said above is for real. 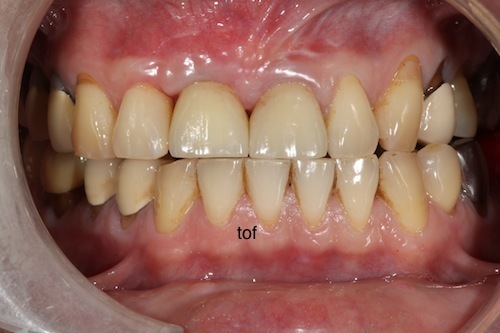 If you have already read this article, you will know what tof means here. 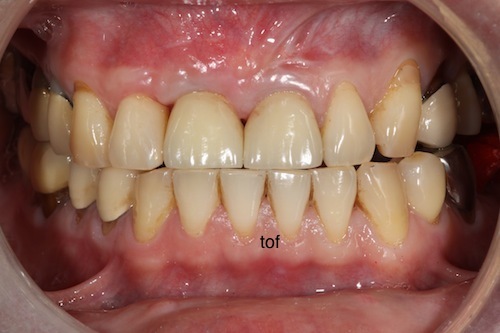 Hence, in the next series of articles, tof is going to use several cases to praise my collaborative partner: Periodontal & Implant Specialist, Dr. Johnny Chang…..
At the location of tooth #11, there was a removable denture bearing one tooth done a long time ago, and it was interesting enough that the client has a serious problem on bruxism. 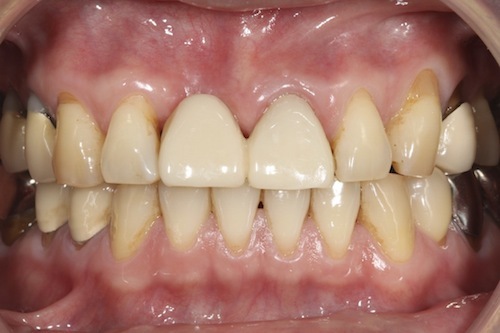 The bruxism was so intense even to interrupt his sleep at night, moreover, by taking a look on the short central incisors of the old denture, we can immediately tell such a condition. 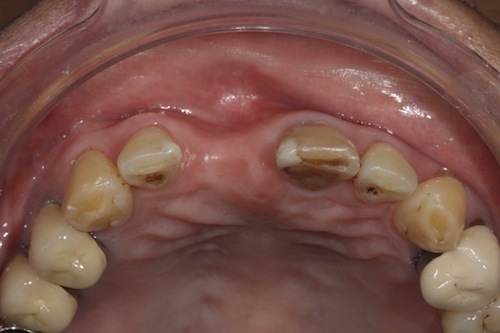 Alright, upon seeing this kind of alveolar ridge, with a slim hope, I showed this case to Dr. Johnny Chang, and see if he would come up with something. 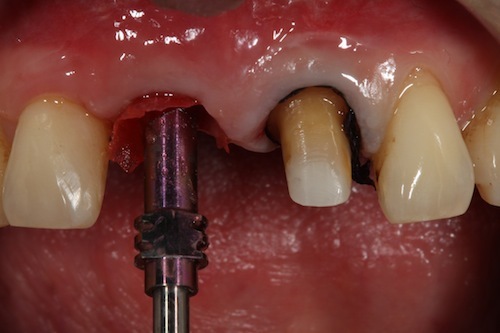 Originally, I would like to help the patient with a simple traditional bridge (with CTG and ovate pontic probably), and that would be just fine. 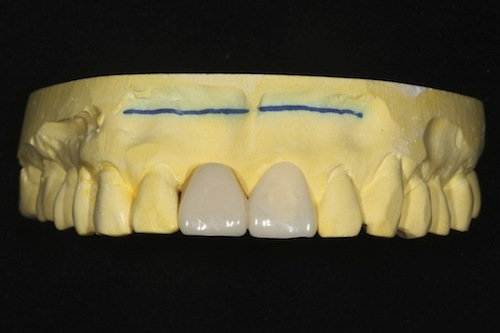 Why should I risk my sleep for wanting to rebuild a tooth on a site which was seemingly impossible to do with an implant? 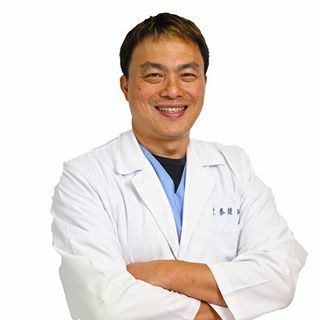 But I couldn’t believe that Dr. Johnny Chang had chosen to go with GBR (Guided Bone Regeneration) technique to rebuild the whole thing. 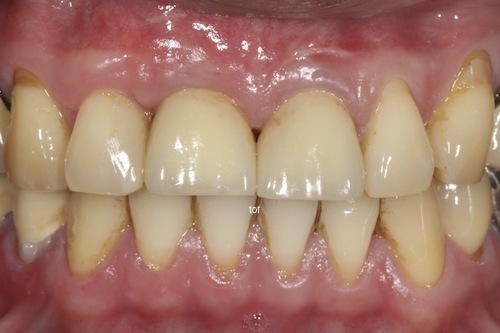 “But did you notice that it is a maxillary central incisor, and there has already been with bone loss for over a decade? !”, said tof. 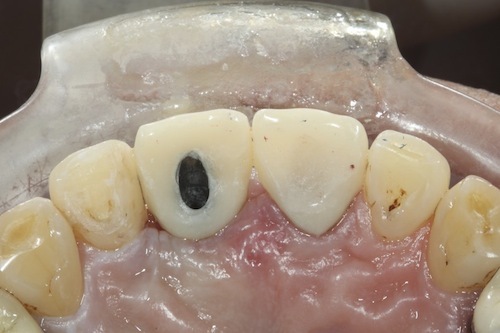 Things like this, specially when something goes wrong, even though there is enough bone height vertically, without gingiva supported by horizontal bone part, the tooth #11 will look longer than tooth #21. 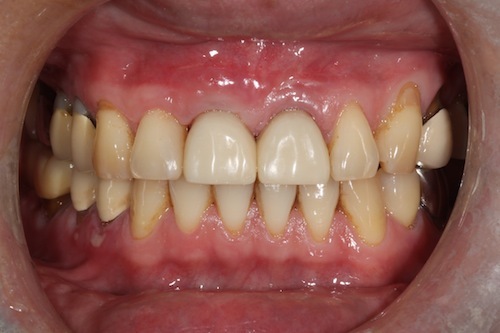 If this does happen, the patient will usually blame it all on the prosthodontist, instead of the surgeon. So just imagine if that was to happen, tof, who had aging parents and young children to take care of, and my hard-working reputation was to crumble to pieces due of this. Moreover, how could I face my hundreds and thousands of fans out there? 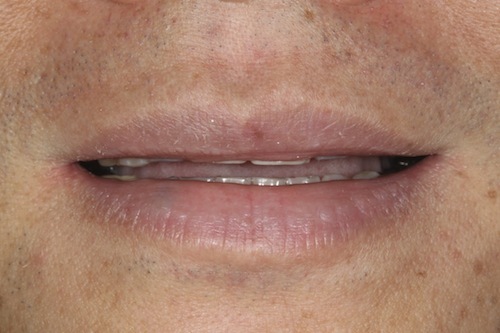 Therefore, tof had just taken Johnny’s words as a promise, to proceed with the procedure for making a temporary Maryland bridge and placed it on the patient. 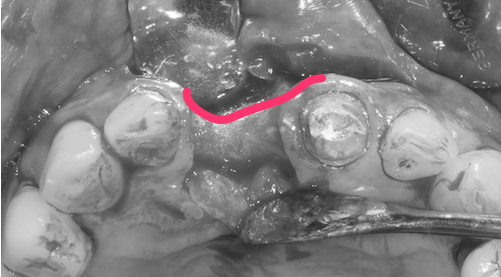 Have you noticed that the mesial part in the above picture of tooth #12? That was also restored with O.D., to make rearrangement on the space. 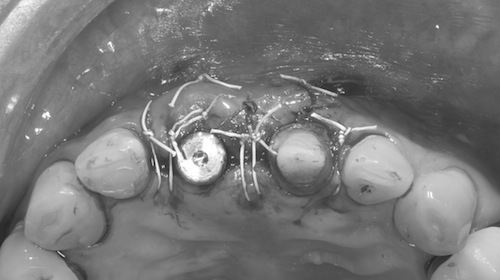 So, knowledgeable as tof immediately associated this to the study made by Vig. in 1978. As Master Vig. 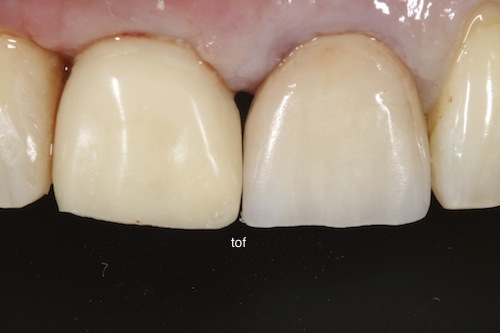 has said that the teeth should be exposed for 2mm during the rest position for the adult males, and with my deligent immersion of numerous books, tof has made attempts to add length of the central incisors in the picture about 1mm, allowing more display on the tooth, as a result, the tooth will not look too square with regard to the width/length ratio. 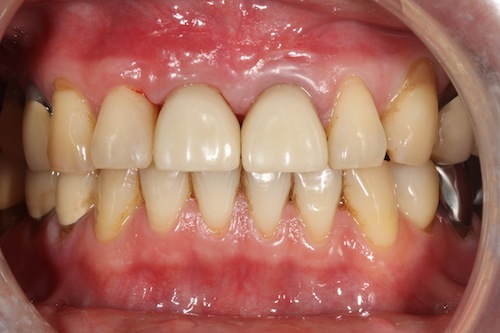 Later on, the patient was transferred to the periodontal department. 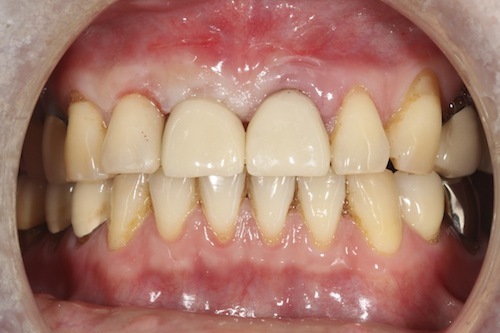 The periodontal department in tof’s clinic is well-guarded with high security, and for anyone who is not a staff of that department, he/she can not go near it, while the works on confidentiality and against spying are meticulous. On hearing that statement, a flash of mind went by, “Oh, no!”. Dr. Johnny Chang should know this well that tof’s blog is located at a “remote” place where few people droped by, it’s hardly possible to accumulate one hundred of “like”? Would this mean that if tof wished to steal the technique of GBR from Dr. Chang, all of my hopes would be down to the drain? 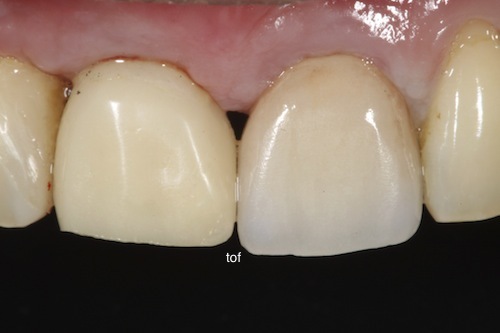 With everything up to the moment, tof felt amazed and came to admire: “How incredibly good Dr. Johnny Chang is.” On the aspect of tooth implant for upper anterior incisor, the thing concerned the most was with the effect on aesthetics problem due of unevenness of gingiva. 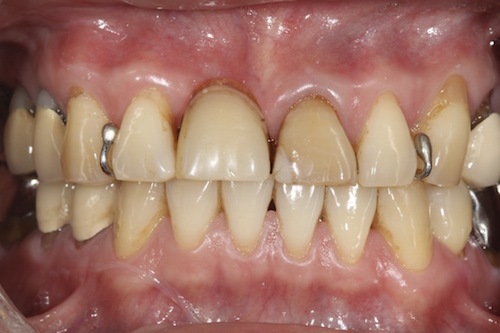 Amongst them, the rule #1 is: as long as the labial gingival margin of the implant temporal crown is more coronal than the contralateral tooth, it will then be all set. 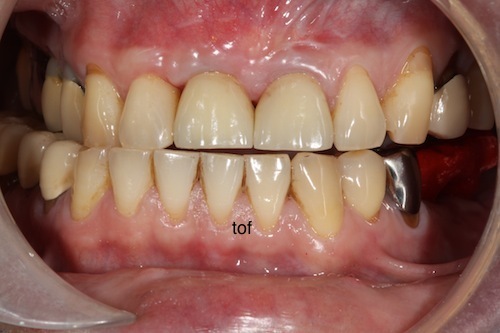 Hence, tof has kept the habit that it’s better to see more gingiva than less after surgical reconstruction. 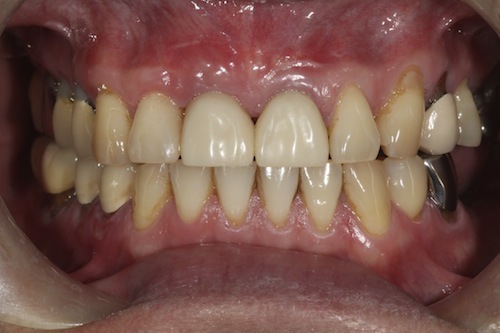 Since the surgery part was already done perfectly, of course there should be no mistakes made by the prosthodontist. 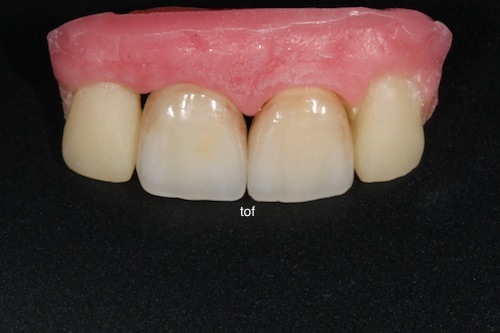 As a result, tof has started with application of addition/elimination on resin for the emergence profile of the implant temporary abutment, in order to put the gingival height at the same level for both of tooth #11 and #21. 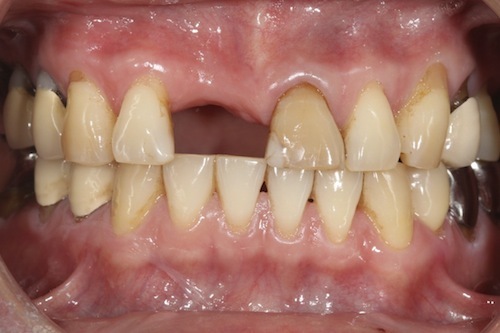 Interestingly enough, the mighty mother nature not only did shape out the gingiva on the temporary crown stage, by using bruxism of our patient at night, but also form the incisal edge configuration as what tof has intended to make for the patient later on, and to believe it or not, please check yourself on both above and below pictures, here you can see that with the incisal edge on the teeth already grounded over a decade by the patient (below picture), does it look like exactly the same as the temporal crown one (above picture)? 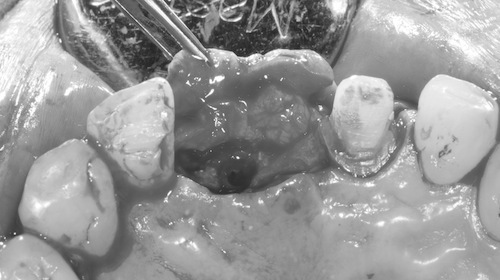 Everything from here was much simpler, by using the emergence profile of the temporary abutment, tof made the final impression. 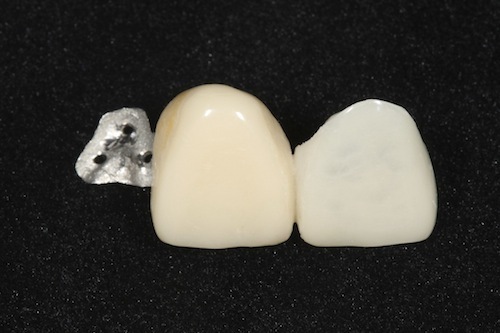 It was sent back by the technician for biscuit tryin after the definitive crowns were completed, and tof placed them on the shade verification cast to verify shades. 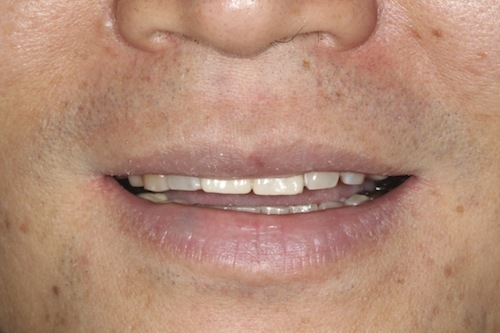 Dr. Johnny Chang rebuilt the missing bone to the patient, while the Mother Nature (constant force of bruxism) remade both gingival architecture and the incisor edges . Then, what did tof do here? Haha, tof has recorded it here so you all know what was going on and how remarkable it was, right?….